Morinaga & co., LTD. has released the new product, ‘Ottotto Ice Cream (140 yen)’ in Family Mart on 31th of May. This is an ice cream to reproduce the popular snack, ‘Ottotto lightly salted fravor’ How does it taste? A lot of people are curious about it so I actually tried it. 3 The flavor becomes lightly salty like original Ottotto, as advancing eating. The ingredients of this are the same to original one, so it seems that this flavor is almost identical. Can you believe that the reproduction of Ottotto is possible even such saltiness? 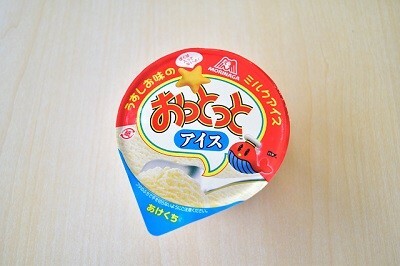 On the package, a starfish-shaped object is saying ‘I’m not in ice cream’. The content is snow-white milk ice cream. At a moment I doubt it’s not related to Ottotto. However, the scent of it seems like original product. Further its smell is similar to clam chowder due to the combination between milk and light salted snack. The flavor becomes lightly salty like original Ottotto, as advancing eating. To take a mouthful of ice cream, the sweetness of milk would be spread gradually and a little saltiness would be left as a finish. Initially I think ‘is it Ottotto?’, whereas the flavor becomes similar to ordinary one which has potato taste little by little. According to the publicity of Morinaga & co., LTD., some store have already been out of stock for a day from it went on sale. Unfortunately it has a limitation of sale quantity, so that you should go to Family mart immediately if you want to try it! Oh no! The full-sized Gundam figure at Odaiba will be removed….